Margaret and Ken Vinicombe originally made cheese for Kervella and eventually branched out into their own venture in 1996 and have succesfully launched their cheese into the restaurants of the finest dining establishments throughout Australia. Margaret is particularly fastidious about the quality of her milking herd to achieve the best flavour from their milk. Good herd management means high quality milk, which in turn means good tasting cheese, which is exactly what we get from Kytren Goats cheese. 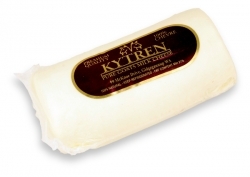 Kytren Chevre is 100% pure goat's milk cheese. After pasteurisation, the milk is gently heated with the addition of rennet to form a curd. The warm curds are then poured into their individual moulds to drain overnight. The fresh chevre is very soft and light in texture that has a very pleasant feel in the mouth. Its flavour is delicate and not overpowering. This product is a random weight product and therefore, the weight and the amount will only be available once the goods are shipped.